Today you’ll rise before the birds to travel to Kings Creek Station. Although it’s some time before sunrise, you may be lucky enough to see the outback coming to life. Keep an eye out for the local wildlife as they wake for the day – dromedary camels, kangaroos, brumbies and dingoes. After a little under 2 hours on the road, you’ll arrive at the enormous site of Kings Creek Station. Established in 1981, the station is a working cattle and camel station that covers an expanse of 1,800 square kilometres. You can take some time to explore station life and maybe even go on an optional camel ride led by the station hands. Or you can simply relax in the station café and treat yourself to a home cooked breakfast (own expense). Their coffee is said to be the best in the Territory! It’s back on to the coach now for the 30 minute drive to the amazing Kings Canyon. On arrival you’ll realise that you’re experiencing something out of the ordinary. Located in the heart of Watarrka National Park, Kings Canyon is set among an incredible ancient Australian landscape that is sacred ground for the Ulpinyali and Lilla people. If you’re taking the six kilometre Rim Walk, you’re in for a memorable experience. 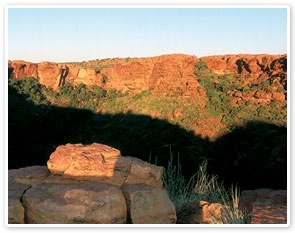 You’ll climb up a 100 metre cliff face and walk around the rim of the canyon’s sandstone walls. This walk has some of the most impressive views looking out over the sandstone cliffs and down over the cliff faces. 270 metres down into the chasm, between the sandstone cliffs you’ll arrive at a true oasis known as the Garden of Eden. Here, a natural spring waterhole surrounded by local and exotic plants and trees such as gums, bonsai looking trees and enormous prehistoric ferns all create a truly unique landscape. If you’re interested in something a little more relaxing, the Creek Bed Walk is ideal. Take a little more time to enjoy your surroundings before setting off on your 2 kilometre stroll following the rocky creek bed that will lead you to views of the impressive canyon rim. Now we’re off to Kings Canyon Resort – an oasis in the outback! While here you can treat yourself to lunch (own expense). To experience the view from above, optional scenic helicopter flights are available at the resort or bring your swimmers if you’d like to take a dip in the resort’s pool. Sit back and enjoy the amazing outback scenery as we head back to Ayers Rock Resort (Y19) or Alice Springs (Y20). It’s still daylight, so there’s plenty to see along the way.